The black currant prompted some more childhood memories: when I was about 4 years old, my mom used to have a small vegetable garden behind our house. 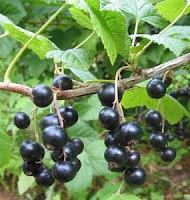 At the end of the garden were several black currant shrubs and we would pick and eat the berries when they were ripe. Time sure flies, seeing how that is almost half a century ago, sigh. This berry is absolutely my favorite; it is astringent but extremely flavor full, very refreshing and can not be compared to any other berry species. The shrubs can grow up to 6 feet and are native to Northern, Central Europe and Asia. They once were popular in the U.S. as well, but in the 20th century black currant shrubs were banned due to spreading white pine blister rust, which was threatening to the logging industry. Many states have lifted the ban and the awareness of all the health benefits of this currant species is steadily increasing. It may well be that soon these berries can be found in the grocery stores all over the U. S. in which case I would be the first to buy them, hehe. The berries are a good source for antioxidants, vitamins and minerals. They provide many different vitamin Bs and contain a very high amount of vitamin C. They are rich in calcium, iron, magnesium, phosphorus, potassium, zinc, GLA and EFA (essential fatty acid). It is a good cure for diarrhea, dysentery, stress, menopause, acute and chronic allergies, bronchial asthma, allergic rhinitis, and diabetic retinopathy, sore throat and mouth ulcers. It also appears to be a good prevention against cancer and apparently is very helpful in treating depression. Used externally, it works well for treating abscesses, dermatosis, eczema, insect bites. Black currants can simply be eaten raw, but have many uses in the kitchen as well; they are great for making jellies, jams, juice ( known as: 'Cassis'), pies, cordial, liqueur, ice-cream and the leaves lend themselves very well to make a delicious cup of tea. They can be added to desserts or mixed in with sauces and dips to enhance the flavor.